As a fitness icon and motivational mastermind, Shaun T has helped millions of people transform their bodies and their lives through his Hip Hop Abs, INSANITY, and CIZE workouts. But people who think of Shaun T as just a workout force are missing something. He has always focused on building inner strength first, then moving to the exterior. And that inner focus started in his own life. He became the man and motivator he is today after escaping from the abuse he suffered as a child, and fighting his way back from a 50-pound weight gain in his early 20s. He knows firsthand that you can’t drop weight or enjoy better health until you overcome the mental obstacles that cause bad choices in the first place. Shaun T is the creator of revolutionary workout programs Hip Hop Abs, Rockin’ Body, INSANITY, T25, INSANITY Max: 30, and CIZE. All told, these workout programs have rolled up a mind-blowing billion dollars in sales, and transformed the lives of millions of people worldwide. Through his wildly successful infomercials, workout programs, personal appearances, and Trust and Believe with Shaun T podcast, he challenges people mentally, physically, and emotionally, so that they can clear obstacles and become their best selves. He lives in Phoenix, Arizona, and travels the world and the internet to connect with his legions of fans and followers. 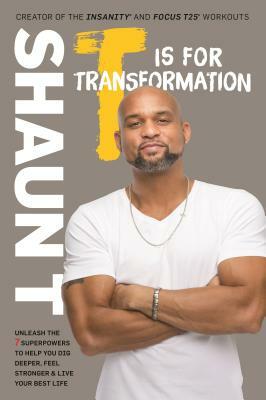 “Shaun T has motivated millions to change their lives and it has little to do with his chiseled physique. It is through his courageous truth, overcoming childhood abuse and insurmountable challenges that you realize it starts with mind-set. T is for Transformation is for everyone who is ready to face their truths, move past their pasts, reclaim the greatness that was always inside of them, and take control of their lives! “This one touches my soul to the very core! Being authentically and unapologetically me is something that I pride myself on... but also something that takes an immense amount of hard work and perseverance. As someone who is a people pleaser and a Yes Girl, it's easy to fall into the trap of compromise... compromising your true self. I can't even begin to imagine what little Shauny endured for so many years. To see him fight his way out of that dark place not only inspires me to be braver, it shows me that no matter what life has in store for us, we can all have a Secret Backpack. We can unleash our superpowers whenever we are faced with life struggles and challenges. “I expected this book to be about the body. How to get fitter and stronger, but it is so much more. Almost autobiographical, it creates pathways for your journey, body and mind. Many of us remember “Come on” from the Insanity program. I keep hearing “Dig Deep.” This is a perfect way to get the tools necessary to understand that nothing comes easy but as long as you know how to focus, anything is possible. It is NOT a book about Shaun T—it is a book about you. He and his life story are a conduit through which you can achieve your dreams.